Tanna of the second century; one of Akiba's disciples that survived the Hadrianic persecutions and transmitted the traditional law (Gen. R. lxi. 3; Eccl. R. xi, 6; comp. Yeb. 62b). With several colleagues he repaired to the Valley of Rimmon to institute a leap-year, and in the course of the discussions that ensued he betrayed considerable passion. Meïr had just cited an opinion which he ascribed to Akiba, but the authenticity of which Johanan denied, adding, "I have waited on R. Akiba standing [by his side as an advanced student] longer than thou didst sitting [as a mere hearer]. 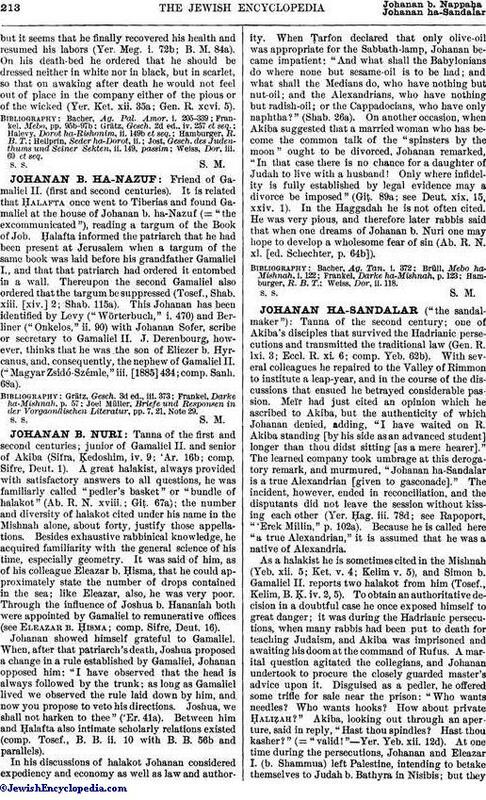 The learned company took umbrage at this derogatory remark, and murmured, "Johanan ha-Sandalar is a true Alexandrian [given to gasconade]." The incident, however, ended in reconciliation, and the disputants did not leave the session without kissing each other (Yer. Ḥag. iii. 78d; see Rapoport, "'Erek Millin," p. 102a). Because he is called here "a true Alexandrian," it is assumed that he was a native of Alexandria. As a halakist he is sometimes cited in the Mishnah (Yeb. xii. 5; Ket. v. 4; Kelim v. 5), and Simon b. Gamaliel II. 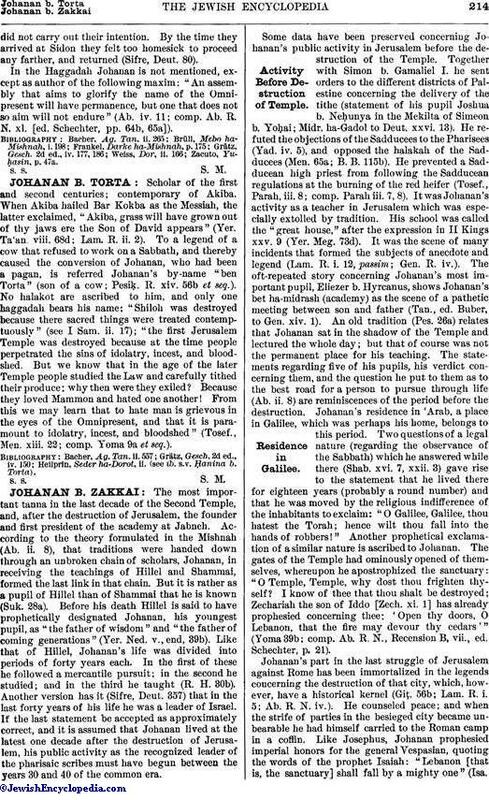 reports two halakot from him (Tosef., Kelim, B. Ḳ. iv. 2, 5). To obtain an authoritative decision in a doubtful case he once exposed himself to great danger; it was during the Hadrianic persecutions, when many rabbis had been put to death for teaching Judaism, and Akiba was imprisoned and awaiting his doom at the command of Rufus. A marital question agitated the collegians, and Johanan undertook to procure the closely guarded master's advice upon it. Disguised as a pedler, he offered some trifle for sale near the prison: "Who wants needles? Who wants hooks? How about private Ḥaliẓah?" Akiba, looking out through an aperture, said in reply, "Hast thou spindles? Hast thou kasher?" (= "valid!"—Yer. Yeb. xii. 12d). At one time during the persecutions, Johanan and Eleazar I. (b. Shammua) left Palestine, intending to betake themselves to Judah b. Bathyra in Nisibis; but theydid not carry out their intention. By the time they arrived at Sidon they felt too homesick to proceed any farther, and returned (Sifre, Deut. 80). In the Haggadah Johanan is not mentioned, except as author of the following maxim: "An assembly that aims to glorify the name of the Omni-present will have permanence, but one that does not so aim will not endure" (Ab. iv. 11; comp. Ab. R. N. xl. [ed. Schechter, pp. 64b, 65a]).